Ask most people to define “branding,” and they’ll be quick to mention the logo or a brand’s look and feel. But branding is much more than a swoosh, swirl, or any other visual fingerprint. Branding is about how an organization is perceived by its customers. And content (e.g., tone, voice, word choice) is an integral part of branding even if regularly overlooked in the excitement of a rebranding initiative. At Cleveland Clinic, a global health care provider, the brand guide is elevated to new heights. Many organizations have public style guides and press kits. Countless others have internal editorial guidelines. Cleveland Clinic’s comprehensive microsite, OnBrand, supports the complex requirements of a content-powered brand. The site offers expected identity assets (e.g., logos, color palette) and style guide; but OnBrand takes it further. From detailed writing guidelines for its hundreds-strong army of content creators to media-rich facts and figures for external influencers and the media, OnBrand is a model for content marketers aiming to scale their efforts. What makes OnBrand unique? Most organizations have one set of brand assets for outsiders (think press and influencers), and another more closely guarded set of guidelines for internal content creators. Cleveland Clinic understands that to be a content-fueled brand, you must set these assets free. Far from circumscribing who can be a content creator, Cleveland Clinic is intent on expanding that definition. Behind the effort are Amanda Todorovich, director of content marketing, and Brian Gresh, executive director of multichannel content marketing at Cleveland Clinic. The duo manages the team responsible for OnBrand, which was launched in late 2012. A core internal team collaborated with an outside design firm to write content, gather assets, and create the site map. From initial stakeholder discovery sessions to taking the site live, the process took five months. Far from a simple resource center to download logos or presentation templates, OnBrand answers the strategic “why” for those telling the Cleveland Clinic story or speaking for the brand. The site offers an introduction to Cleveland Clinic, including the medical center’s history, mission and vision, and “pride points.” There is also the Cleveland Clinic Narrative, a long-form description to help content developers tell a consistent story about the organization. For those who just want the logo, fonts, color palette, or photos to use in their materials, there’s a section called Get the Basics. A section called Explore the Guidelines includes detailed advice about design, writing, printing, web, and mobile. Finally, a Why OnBrand? Page – the site’s centerpiece – invites content collaborators to consider themselves caretakers of the brand. The guidelines continue to evolve and are updated as new situations arise. It’s also important to maintain the site to feel fresh, Todorovich says. A team of writers and designers collectively identify what is needed. OnBrand tells a story about what the brand means and the implications of going off-brand. The brand guidelines are available to everyone at OnBrand.ClevelandClinic.org, making them accessible to partners as well as those within the organization. To educate internal users, OnBrand is prominently featured on the intranet, and Todorovich and her team do education pushes to internal audiences. The team’s brand manager spends a lot of time not only maintaining the brand guidelines, but also leading meetings with heavy users to educate them about the brand. As with any large organization, there are always new people to onboard and educate. Mary Darif, Cleveland Clinic brand manager, does double duty as a project manager. “It’s not just her job to protect the brand,” says Todorovich. “Everyone should be a brand ambassador.” That message is carried from the CEO on down: Dr. Delos Cosgrove has standards in the way he communicates with the enterprise. “Having the message come from leadership helps the team enforce the brand standards,” Todorovich says. 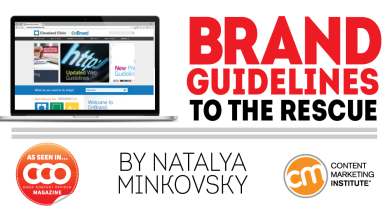 Having strong, enforceable brand guidelines gives the content marketing team more freedom to focus on content quality and exploring new opportunities to reach its audiences. Cleveland Clinic’s content is created around three guiding principles; the information must be useful, helpful, and relevant. This “sniff test” is applied to all content before it’s published to ensure that the organization is putting patients first. Is the information easy to understand? Would a patient talk about this topic with her friends, for example? Are there clear next steps (e.g., a phone number or link) for those who need a professional opinion based on the information? While evaluating content against the guiding principles is an art, not a science, data always plays a role. When a topic performs well, the team starts to think about other formats in which it can be presented. Gresh oversees the 20-person content marketing group as well as web and application development. “We have to accept that no one will succeed individually,” he says when describing the organization’s large and siloed marketing division. With the content marketing group responsible for both digital and print content, Gresh looks for other opportunities to evolve and integrate. Regular touchpoints with PR, communications, and advertising are part of that effort. The team also works closely with physicians and other subject-matter experts. “How do we align all those teams together when content is the unifier, when we all have stories to tell,” Gresh asks. Educating content collaborators about the brand and providing a comprehensive brand guide empower creators to tell clear, consistent stories. As written in OnBrand, those stories “reinforce our message, build up our reputation, and connect with more people” – important content marketing strategy goals every organization is likely to agree on. Cleveland Clinic relies on hundreds of writers, designers, and subject-matter experts to inform a global audience about chronic diseases, health-care innovation, and emerging health topics. With such a huge stable of contributors, the brand needed a centralized resource to help the team convey a coherent tone of voice and visual style. OnBrand is not simply a brand guide nor the requisite “history of our company” found on most websites. OnBrand serves the need of the content-focused organization, arming internal and external publishers with the tools and guidelines they need to tell Cleveland Clinic’s story. The entire Cleveland Clinic content team is involved in managing OnBrand. Writers provide updates to AP Style and Cleveland Clinic data, designers supply new images and style guidelines, and the brand manager reviews the whole for consistency before making updates to the site. Writing guidelines – rules related to grammar, punctuation, spelling, usage, and best practices for writing for the web. Guidelines also need to address how writers should refer to your organization and any sub-brands in different contexts. Information about voice, tone and word choice can also be incorporated – provide examples when applicable. Web design – guidelines for designing and maintaining websites, including colors, web fonts, images, iconography, and specific elements such as buttons, banners, features, accordions, and tabs. Include information about mobile-design standards when applicable. Print design – layout specifications for commonly used collateral, such as brochures, posters, and mailers. If there are rules for printers to use and how to choose paper, include them in the guide. Learn from Cleveland Clinic’s Amanda Todorovich in person as she presents at Content Marketing World this September. Register today and use code BLOG100 to save $100.